Hit the boulevard in style or, better yet, detour to steelhead camp and don't look back with the shirt that functions as good as it feels. Simms Wool Blend Flannel is a warmth-booster bundled with benefits such as wicking, quick-dry fabric and UPF 50 tech. In addition, ease of movement just got easier thanks to darted, pleated, and patterned tailoring, while a simple button-front, shaped hem, and traditional fit come standard. "FEATURES & BENEFITS: Wicking, quick-dry & UPF 50 Darted, pleated & patterned for ease of movement Button-front & shaped hem FABRIC TECH: 80% Wool/20% Polyester 150 g/sm APPROX. WEIGHT: 10.4 oz. 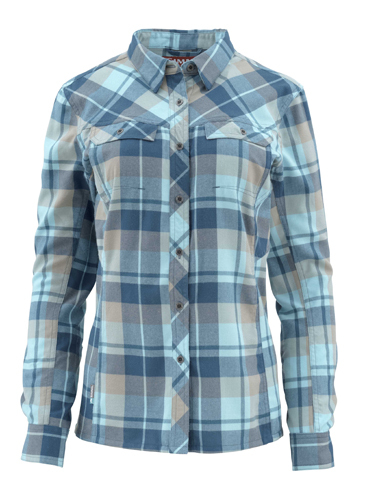 STYLE FIT: Traditional Fit SIZES: S - XL"
I have worn this flannel almost every week this winter. It is fitted perfectly (I'm 5'5" about 120lbs and the small is perfect). It's extremely comfortable and warm. I've gotten several compliments as well!